This unique blend truly expresses the spicy, aromatic tones of its three varietals, Cabernet Sauvignon, Zinfandel and Cabernet Franc. The nose has nice floral and red berry aromas with hints of tobacco leaf and cedar tones. On the palate, the wine is medium bodied with easygoing tannins, a vibrant backbone of acidity and smooth, long finish. The balance of acidity and supple texture on the edges of the palate and the finish should allow it be paired with a fairly wide range of foods. The 2007 first release was barrel-aged in French and American Oak for 27 months before being bottled in late April of 2010. 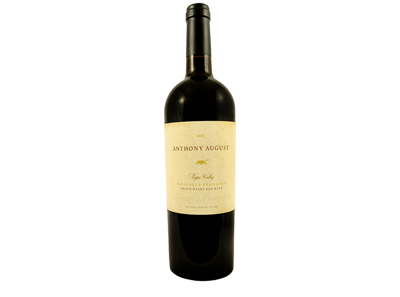 Our first release, October 31, 2010, yielded 364 cases of Anthony August Proprietary Red Wine.